Vocabularist is a free Windows 8 vocabulary app available under ‘Education’ section of its app store. 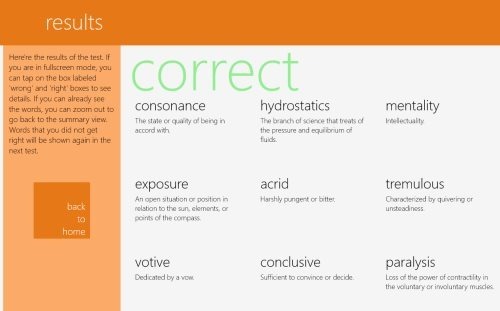 This vocabulary Windows 8 app is one the most effective ways to build and expand your vocabulary. You can learn new words, everyday and explore language, right at your Windows 8 screen. The app has been designed for everybody – right from beginners to intermediates to experts, anyone can expand his vocabulary skills using this simple vocabulary Windows 8 app. It, aims to help students who are preparing for standardized tests such as GMAT, GRE, SAT, TOEFL, etc. This Windows 8 vocabulary app guides you to learn new words by displaying 10 at one time so that you can remember those words along with the correct definition of each word. And, you will remain on this level till the time you learn more than 50 new words. As you start a test, you will see one word and five definitions. You need to click on the right one. 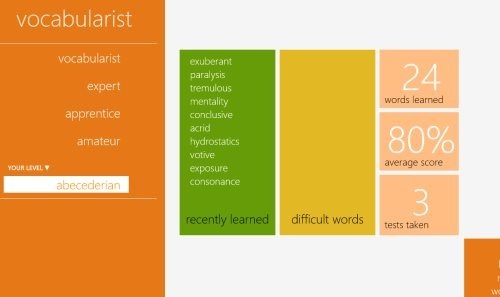 As you open this Windows 8 vocabulary app, you will find 5 different levels: Vocabularist, Expert, Apprentice, Amateur, and Abecederian. You will see your level just below these levels. Moving ahead, you will find recently learned, difficult words, words learned, average score, and tests taken. Let me quickly point out the main features of this vocabulary app for Windows 8 below. Lets you build and expand your vocabulary. Lets you learn new words everyday. Helps students who are preparing for standardized tests such as GMAT, GRE, SAT, TOEFL, etc. There are 5 different levels: Vocabularist, Expert, Apprentice, Amateur, and Abecederian. You can see your score and view the summary of your results. See what words did you get right and wrong. Well.. I really liked this vocabulary app that lets you improve your vocabulary skills and expand your language. Prepare for your entrance exams on your new Windows 8 screen. Also, check out our posts on eBook Apps, Language Translator Apps, and Dictionary Apps. Open this link in IE10. Click on ‘View in Windows Store. Proceed with further installation steps. In short, Vocabularist is a good utility Windows 8 vocabulary app where you can build you vocabulary and become the master in English language. Go ahead and download Vocabularist app in Windows 8 now.